No one interested in earning a master’s degree in health administration wants to pick a program from somewhere in the middle of the pack. It stands to reason that eager graduate students interested in leadership roles in healthcare organizations, medical device and pharmaceutical companies would be looking for programs that lead the pack. It’s a big investment after all, so it’s wise to make sure you’re getting the biggest bang for your buck. The medical industry is a $3.3 trillion behemoth, representing almost 18% of total GDP in 2017. This is an industry where bad decisions can literally cost lives, and where rapid innovation is upending how business is done, requiring leaders who are miles ahead of the curve. Healthcare already employs more workers than any other American industry, but managers are struggling to fill open positions as the massive shortfall in qualified front-line professionalsbecomes a chronic problem, and one that’s getting worse every year. At the same time, the people managing that whole complicated ball of wax are going to be overseeing a period of explosive growth in the coming decade, with projections suggesting that today’s $3.3 trillion industry could be worth nearly $6 trillion annually by 2026. It’s not a field you get into if you’re not prepared to be the very best, both personally and academically. If you want to be an executive taking responsibility for some multi-million dollar chunk of this freight train, you had better get the best possible training you can, because you’re going to need it, day one. And that means pinpointing the best CAHME (Commission on Accreditation of Healthcare Management Education)-accredited master’s in health administration you can find. CAHME was founded in 1968 specifically to accredit master’s-level programs in healthcare administration and leadership. It’s been recognized by CHEA, the Council for Higher Education Accreditation,and the U.S. Department of Education,so clearly they know what they’re doing over there. As of 2018, it’s gone global, working with programs both in North America and around the world to ensure they are offering the absolute highest standards in healthcare executive education. These standards run through everything – from faculty selection and hiring, curriculum development and review, and graduate outcomes, to administrative policy and procedures. This all happens through an in-depth evaluation process that includes reams of paperwork, on-site visits, and interviews. Staffed in part by industry veterans and with input from major insurers, medical associations, and provider societies, CAHME takes its role as gatekeeper seriously. And the Commission doesn’t rest on its laurels, either. Healthcare changes fast, and so do the CAHME assessment standards. 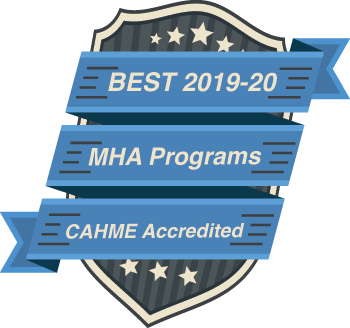 As recently as 2018, CAHME rewrote rules to improve the flexibility and continuous improvement of accredited programs. It all adds up to make CAHME approval the bare minimum for making our list. We made our selections for this list only after a careful review of the more-than-70 universities across the U.S. offering CAHME-accredited programs. This involved a long look at dozens of MHAs and MS degrees in health administration, MBAs with a health management concentration, and even MPA and MPH programs with a health administration focus. In the end we felt it was well worth the effort to be able to present our readers with a short list of programs we could feel confident calling the very best. All universities need to give attention to attracting students, but you don’t want a program from a school that spends more time and money on a slick website design than they do on curriculum development. The bottom line is that curriculum has got to be more than current – it needs to be ahead of the game in this industry with plenty of attention given to preparing health organization leaders who are beyond comfortable with data-driven strategic decision-making and the technology behind it. The wise souls at CAHME don’t look for cookie cutter programs, and either do most health administration grad students. Naturally, we recognize that various specializations, teaching approaches, and techniques can all be equally valid, and that some of those alternative approaches may prove valuable to different types of students. Some schools also offer a little something extra in terms of credentialing—one program offers certificate options in health care informatics or Six Sigma Green Belt status… both in-demand specialty areas that will make your resume jump right out of that stack and into the hands of the right person. We looked for schools that offer a little something extra, setting themselves apart in the way they create an exceptional student experience and bring concepts to life through experiential learning. Things that stood out to us included opportunities for studying overseas, outstanding on-campus research centers and programs, superstar faculty, great internship opportunities, and national and international awards that recognize achievement in these areas. All of this is often reflected in high graduation and placement numbers among graduates in recent years. Even though you’ll be making big bucks as a healthcare executive, we know that nobody goes into a degree program with a blank check. Value is an important part of education—you want the most mileage out of your tuition dollars you can get. When reviewing graduate degree programs is your business, you get a feel for when tuition rates are marked up, versus those that are set at a price that is genuinely reasonable. None of these degrees come cheap, but then again you’re not looking for a cheap program, you’re looking for a good one at a decent price. That’s why we gave extra consideration to any program that delivers an exceptional education at a price that is comparable to the competition. We also looked at format and scheduling. Many graduate students are coming in with family commitments and existing professional responsibilities. Maybe you can’t just drop everything and relocate for two years to get your degree. Whatever the case may be, every graduate student these days requires some degree of flexibility, so we found schools with online options, or that offer programs with evening or weekend classes designed to meet the needs of busy executives. Top Picks: A Short List of Our Favorite Health Administration Master’s Programs in the U.S.
We didn’t just give you a list and leave you out in the cold to figure out the important elements of the programs on your own. We give you all the key points right here. You’ll find information on admissions standards, whether or not you’ll need to go out and take an exam like the GMAT to be considered for the program, whether or not there are restrictions on the dates you can begin courses, pace and scheduling options, and more. Maybe you’re already working in healthcare management and plan to earn a master’s to improve your shot at an executive position, or maybe you’re just graduating from your bachelor’s program and want to start off on a track that will position you for a leadership role. In either case, it’s worth taking a few minutes to review our top picks to see if the right program for you is somewhere on this list. The MBA in Healthcare Administration at the Baruch College Zicklin School of Business really impressed us, not least of all for the international study tour that’s included in the program. Towards the end of your program you’ll travel with a faculty member to an international location for at least eight days to get a first-hand look at what healthcare management is like in the global village. Zicklin School of Business is home to the Paul H. Chook Department of Information Systems and Statistics, the Narendra Paul Loomba Department of Management, and the Department of Law to name just a few. You’ll have so many opportunities to network with professionals in related fields here, you can be sure the contact list on your smartphone is going to be a lot longer by the time you graduate. We were truly amazed at how many awards, distinctions, and publications are credited to the faculty of this program. Publications range throughout a wide variety of fields of expertise, and awards have included the Presidential Excellence Award for Distinguished Service, the President’s Award for Excellence in Teaching, a listing in the Who’s Who in America, and many more. Altogether the full-time faculty in this program share 108 publications and 85 awards, averaging eight publications and seven awards per person! We love how the Baylor University Hankamer School of Business emphasizes in-the-field hands-on learning as part of your academic development. This includes a six-month internship placement where you’ll work side by side with healthcare executives applying everything you’ve learned to make real-world decisions. Baylor is home to 11 research centers and institutes that attract top professionals from across the nation, including the Robbins Institute for Health Policy and Leadership and the Center for Nonprofit Leadership and Social Enterprise. The annual case competition for ethical leadership in business that takes place at Baylor brings together talent from across the nation and provides you with a great opportunity to cross-pollinate your ideas with academics and leaders in your field. This includes the opportunity to present your own research at a professional conference, with funding for further research awarded to the best presentations. If you’re a federal employee, you have the option to pursue a stand-alone MHA or a combined MHA-MBA program. The amazing faculty here are the underlying reason for the impressive numbers coming out of this program, with both graduation and job placement rates north of 90%. An exceptional 92% job placement rate for graduates is how the Master in Health Administration program at the Cornell University College of Human Ecology first caught our eye. That’s an average 92% over the past five years for graduates of the Sloan Program in Health Administration… in just one month after graduation! Instructors start preparing you for a successful transition to the professional world from the moment you enroll. As a first year student you’ll attend several job development and career workshops designed to help you hone your professional networking skills. One reason for such an amazing job placement rate within just a month of graduating is because of this program’s capstone consulting project. In your final year you’ll pair with a small group of your colleagues to work on a real-world consulting project with a health care organization. Recent projects have included an initiative to grow patient intakes, the redesigning of physician schedules, and a hospice house feasibility study. The Sloan Colloquium Series brings high-level executives to campus every semester. We think this is an outstanding opportunity to gain insight directly from the best in the field. Taught by guest health care executives, Practitioner-Led Intensive Courses (PLICs) cover a range of important topics from big data to strategic change and healthcare facilities planning. From paid summer internships to close proximity with healthcare executive leaders to consulting projects, the exceptional faculty in this program run a tight ship to ensure you have the absolute best opportunities available to you when you graduate. Located in Virginia near the halls of Congress and national provider associations, the MS in Health Care Management at the Marymount University School of Business and Technology structures courses around national healthcare policy and the legislative process, providing a learning experience you won’t find anywhere else. The number of options this program offers to let you custom-tailor your education was also something unique enough to catch our attention and earn it a spot on our list of favorites. With options that include stacking on an MBA or MS in IT through a dual-degree program, or earning Six Sigma Certification or an informatics certificate concurrent with your degree, graduates coming out of the School of Business and Technology can take their Careers in all kinds of different directions. And for a global perspective on health care management, you can take advantage of the unique opportunity to study abroad in countries like the Netherlands, Germany, Panama, Ireland, and Canada, giving you an invaluable experience that leads to a greater depth of perspective in the field. As a graduate of the Master of Health Administration program at the New York University Wagner Graduate School of Public Service, you’ll join a network of over 12,000 professionals across the globe, as influential in their local communities as they are in developing national policy. Graduates have gone on to work at places like the US Department of Agriculture, DC think tanks, and with organizations like the World Bank, where one graduate is leading research into how women in sub-Saharan Africa can be empowered economically. While this program wants to admit every student who seems like a good fit, they receive several hundred applications to fill around 55 open slots. If you’ve got what it takes to get in, you can be sure instructors will do everything possible so ensure your success, providing one-on-one career counseling and networking events with leading industry representatives along with professional workshops. Faculty members serve as top managers at the most prestigious healthcare systems and hospitals in the nation, holding influential positions that include serving on the Congressional Budget Office Panel of Health Advisers. Once you graduate from the Master of Health Administration program at the Ohio State University College of Public Health you will be joining a network of over 1,000 alumni across the nation. We’re really impressed with the 95% professional employment rate, with recent graduates going on to positions at major healthcare organizations like MedStar Health, United Health, Akron Children’s Hospital, and Kaiser Permanente – as well as nationally recognized companies like Ernst and Young, Deloitte, and Grant Thornton. The College of Public Health is home to leading research organizations like the Center for Health Outcomes, Policy and Evaluation Studies (HOPES) and the Center for Public Health Practice. These centers serve as focal points of expertise, attracting professionals from across the nation and giving you the opportunity to network and gain new insights. Recent studies undertaken by the Center for HOPES include a status report on Medicaid reform, a study of employer-sponsored elder care programs, and a study on children’s access to psychiatric services. You’ll complete a residency at a health service organization the summer after your first year, giving you the unique experience of being part of a clinical care team at the OSU Wexner Medical Center. If you choose to participate in a case management team competition with other schools you’ll have an unforgettable experience learning valuable skills you can add to your CV. Your curriculum also includes guest lectures, case analyses, and highly qualified professors dedicated to your success. The international opportunities available in the Master of Health Administration program at the Suffolk University Sawyer Business School place this program in a league all its own. When it comes time to do your one-to-two week residency, you could take advantage of international opportunities with partner institutions in the UK, Germany, Ireland, France, and Brazil. During a recent global travel seminar, MHA students had the opportunity to tour National Health Service facilities in London and meet with the prominent professionals responsible for that program’s success. The research opportunities at this school are awe-inspiring. Home to some of the nation’s leading centers, experts come from all over the country, making the Sawyer Business School fertile ground for learning, networking, and overall professional development. This notably includes the Center for Innovative Collaboration and Leadership, the Moakley Center for Public Management, and the Center for Executive Education. The MHA program is proud of its many accomplishments and is especially proud of its faculty, bringing a global perspective to the classroom with nearly one-third of instructors here coming from abroad. The world-class faculty here hold top positions in the field and have many journal publications to their credit, but more than anything they are dedicated to mentoring you to success. The Master of Health Administration program at the Temple University Fox School of Business combines a competitive blend of financial acuity, management, opportunity realization, and business reasoning into its curriculum to produce the kind of professionals top employers are looking for. That’s a fact. The school surveyed over 300 leaders at top organizations and they reported they’re looking for exactly this blend of skills. That’s just one of the reasons why this is the only program of its kind in the entire Philadelphia region. Upon graduation you’ll join a unique global community of alumni more than 60,000 strong. An alumni network this size is only possible with a long and proven track record of success. The Fox School of Business has that in the bag, celebrating its 100th anniversary this year. Fox School is home to over 200 full-time faculty, 26 student organizations, 21 centers and institutes, and seven prestigious national professional and academic journals. Together, you’ll find everything you need here to develop your expertise along the path you’re most passionate about, all in an environment designed to produce the best healthcare leaders in the industry today. As a student of the Master of Health Administration and Policy program at the Uniformed Services University Department of Preventative Medicine and Biostatistics, you’ll spend half your time in the classroom and the other half in the field. A year of hands-on experience is a unique opportunity in itself for an MHA program to offer, but wait till you hear your options for fieldwork sites in and around the National Capital Area: Department of Defense facilities, major healthcare facilities, federal health and policy agencies, major research facilities, and even health policy think tanks. As you are directly plugged-in to the nation’s healthcare administration and policy systems you’ll have extensive opportunities for networking and mentorship with leaders in the field. This program is ideal if you’re interested in a leadership role in the Military Health System, or other federal healthcare partner organizations. And you don’t even need to be enlisted or married to a member of the armed forces; this program is open to civilians and uniformed personnel alike. As a student you’ll complete an independent research project which you’ll be encouraged to submit for professional publication, as well as an 108-hour public health practicum that can involve clinical practice, research, service delivery, or policy making. We are really impressed with the opportunities students have for hands-on experiential learning here. On top of that, a 100% graduation and job placement rate tell you all you need to know about how well this program prepares students for professional practice. The MHA at the UIC School of Public Health provides students with the unique opportunity to be mentored and work alongside senior management for a full 12-month preceptorship. In addition to providing you with valuable hands-on experience at one of two-dozen health care organizations in the area, it will put a high shine on your CV, and could even lead to long-term employment. If that wasn’t enough, you’ll also complete a capstone research project that involves analyzing a real-world issue at a sponsoring health care organization. Past UIC students have come up with ideas the sponsoring organization liked enough to implement and were offered full-time positions. In fact, more than half of all students in this program have a job lined up before they graduate! With more than 25 institutes, programs, and centers affiliated with the School of Public Health, you’ll find ample opportunities to network with the best and brightest in the field. We can’t do this program justice without an honorable mention of its highly distinguished award-winning faculty. Whether it’s through national contributions to the public health dialogue, groundbreaking research on front-line issues like AIDS, a $4.9 million research study, or affiliations with organizations like the CDC or WHO, the faculty in the MHA program are world-class. If you’re a highly qualified applicant, this program wants you ASAP. You can receive an offer of admission within five days of your application being reviewed and skip the GRE or GMAT if you have a health-related bachelor’s degree, a GPA of at least 3.5, strong references, and do well on a phone interview. If you already have extensive experience as a clinician with some experience in leadership, the School of Public Health’s 48-credit hybrid Executive MHA would be the perfect fit for you. The MHA program at the University of Iowa College of Public Health is a gem in the heartland of America and an easy pick as one of the best programs of its kind in the nation. If you want to focus on addressing the challenges of rural healthcare administration, this is the program for you. The Department of Health Management and Policy is home to three important research centers that bring together some of the best minds from around the nation to contribute solutions to some of the most pressing issues in healthcare today: the Center for Health Policy and Research, the Rural Telehealth Research Center, and the Rural Policy Research Institute. Even with all this, it’s the faculty here that make the University of Iowa experience so unique for MHA students. Many have had former lives as high-level healthcare executives, while others have contributed to the founding of the department’s unique research centers, conduct research with grants from the CDC and NIH, and work with the EU and the OECD. As a graduate of the MHA program at the University of Miami Business School you’ll join a select club of 45,000 alumni around the world, something that comes with an enormous advantage when it comes to networking your way into your dream career. With more than three-quarters of all students here either proficient in a foreign language or from abroad, and with faculty members from 30 different countries, University of Miami offers a more diverse learning environment than you’ll find anywhere else. The Miami Business School offers merit-based scholarships to ensure you get a seat at the table if you’re highly qualified, so you can be sure you’ll be studying beside the best and the brightest in this field. While the fact that 100% of the professors here hold doctorates is impressive in itself, that doesn’t touch on their diverse range of expertise and research experience, which includes everything from the pharmaceutical industry, to Medicaid and the ACA, to alternative health care delivery systems. It’s no surprise then that they hold distinctions that include the Harry Truman Legacy of Leadership Award, the President’s Medal, the Outstanding Service Award, and the International Women’s Forum Hall of Fame Award, to name just a few. One faculty member was appointed by the US President to co-chair the Commission on Care for Returning Wounded Warriors, and went on to earn the highest civilian award possible in the nation: the Presidential Medal of Freedom! While the Master of Health Care Administration at UNLV is the only one of its kind in the state, that’s not what makes it special. This program caught our eye because of its innovate curriculum that let’s you gain important experience while also tailoring your education just the way you want it, points that made it stand out even among all the CAHME-accredited programs in the country. This custom tailoring includes the option to complete a thesis or capstone research course, and most significantly, a 250-hour internship. The internship segment of the program takes place in a professional setting and gives you valuable hands-on experience at a local healthcare partnership site. If you already have at least three years of relevant work experience in administrative or managerial health, five years of professional work experience outside of healthcare, or a doctoral degree in a health field, you’re a perfect fit for the 36-credit Executive MHA program here. The faculty here at UNLV are nothing short of amazing, bringing years of research and professional experience to the classroom. The proof of the quality of the UNLV MHA can be seen in the exceptional student outcomes – 92% of recent graduates transition to professional practice within three months of completing the program! Being connected is a central aspect of the MSHA program at the University of New Haven School of Health Sciences. This connectedness starts the moment you enroll and continues on past graduation as you join a network of more than 700 alumni who live and work around Connecticut and throughout the world. We really appreciate how this program makes a concerted effort to get you involved in hands-on learning in the field, with options that include working as part of a team in an area hospital to solve real-world challenges as part of your capstone course, or interning at a local healthcare facility like Boston Children’s Medical Center, Bridgeport Hospital, Saint Vincent’s Medical Center, or Yale New Haven Health. This program is designed for convenience and focus, allowing you to attend in the evenings and on weekends, and take some classes online. You can choose three classes from 17 options – a full quarter of the entire program – to tailor your education to focus on the exact health administration niche you’re most interested in. All of these attributes combine to make the University of New Haven MSHA one of our favorite programs to recommend. The MHA program at the University of Pittsburgh Department of Health Policy and Management puts you in the middle of it all. As home to some of the best health research centers in the nation, the Graduate School of Public Health is an incubator for the best learning and networking experiences possible. As a student here, you’ll get individualized guidance from a professional advisory team that consists of at least one mentor, an executive-in-residence, and a residency preceptor. Your mentor will put you in contact with a healthcare executive who will take you under their wing and counsel you on professional matters and career development. Past executives-in-residence have included CEOs from HonorHealth, Grady Health System, and Cedars-SinaiHealth to name just a few. When it comes time to do your management residency or practicum, you’ll have dozens of sites to choose from, making it easy to find the perfect fit. 87% of students who graduate from this program transition into a position they love within 90 days of completing the program. And as a graduate you’ll be joining an alumni network that includes some of the best minds in the health administration field today! With an MHA from the University of the Incarnate Word H-E-B School of Business and Administration you’ll be thoroughly prepared with all the confidence and ethical grounding it takes to be an effective leader in the healthcare industry. This program offers a unique combination of highly experienced faculty and great opportunities to gain a real-world, hands-on education. The capstone experience here involves working as part of a team for a health industry client to study or solve an important management issue. This is more than a point to be highlighted on your CV, it’s a great opportunity for you to put your academic skills to the test in a real-life situation with real-world results. If you want to gain even more concrete experience you can participate in a graduate assistantship, a two-semester program that gives you the opportunity to work 15-20 hours per week with one of the school’s industry partners. All full professors here hold doctorates, and bring with them 83 years of combined experience in the health administration field. Add the years of work experience from the two adjunct professors and the one professor emeritus, and the combined years of work experience jumps to more than 138! That kind of field experience and expertise means you’ll get all the guidance you need to launch a successful career. Weber State University has developed an MHA program that optimizes convenience and flexibility without ever compromising on educational excellence and professionalism. Your classes are offered in a hybrid format so you can study on your own schedule, while your face-to-face classroom time is limited to Tuesday and Thursday evenings. If you’re a mid-career professional looking for a program to take your career to the next level, then the Executive MHA is for you, offering most classes online, with just six on-campus appearances required over five semesters. With faculty made up of both executive industry professionals and pure academics, Weber State has found a way to strike the perfect balance. All of the faculty here have either a doctoral degree or a background in business or healthcare administration. Finding the optimum blend between teaching theoretical concepts and the reality on-the-ground is no small task, but it’s something that Weber State has managed to do flawlessly. The proof of how well Weber State prepares MHA graduates can be seen in the fact that 92% of students secure jobs even before they complete the program.